Welcome to a brand new series called “Money Confessions” where I’m sharing all of the money tips and tricks I’ve learned over the years. 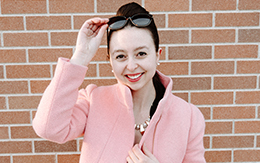 I’m a mid-twenties millennial professional also currently working towards my M.B.A. (snaps for all the boss ladies working towards a degree – it’s not easy!) so believe me when I say I’ve had to learn a thing or two if I want to spend a thing or two! Living on my own, paying for school and paying to keep a blog up and running is no easy feat – but I’m proud to say that I’ve figured a lot of things out along the way and financially, I’m in a really good place. I’ll expand more on my budget, meal prepping and money tips over the next few months, but I wanted to kick this series off by sharing how I get paid to shop – yes, you read that right – I get PAID to SHOP. And no (because I know you’re thinking it), this is not a sponsored post – I’m just sharing some programs I’m really loving to get cash back! You get paid to shop? How? Let me lay some ground rules: there are a ton of rebate, coupon, store rewards, etc., programs out there, these are just the ones I’ve had the most success (aka earned the biggest $$$) with so don’t feel like these are the ones you have to use. Also, I shop very…methodically. I’m the last person on the planet who shops impulsively. Everything sits in a folder in my internet browser and I wait specifically until there’s a sale, a store coupon PLUS double cash back before I purchase something. So in order to get paid to shop, you have to put in the work. I used eBates religiously years ago and then I completely forgot about it – BIG mistake. I signed up for a new account a few weeks ago while I’m purchasing things for my move in two months and holy cow, I can’t believe how much money I’ve earned just by shopping! I even shopped through eBates to renew my blog hosting at GoDaddy and I earned $25 from the transaction! eBates is so easy – I just installed the browser extension so I don’t even have to check the site to see if a store gives cash back – it just automatically pops up PLUS it lets me know if I can save even more with a coupon! Click here to sign up via my referral link and automatically get $10 – start getting paid to shop! It’s every girl’s dream. I know that several of the major banks offer rewards programs, and Chase just happens to be mine, but anytime a store isn’t offered on eBates I shop the store either through Chase Rewards to get extra rewards points, or, I purchase a gift card – for free – through Chase. Two weeks ago, I even snagged a hotel room in Boston for 3 nights for just $62 (a travel hacking post is coming up!). If you don’t live in the Midwest this may not apply to you, per se, but Meijer (a popular grocery store chain up here) has their own app and coupon program called “mPerks” where if you buy a certain amount of groceries each month, you get $$ back to apply to your next purchase. In 2017, I saved a whopping $708.13 between coupons and cash back to spend on future grocery orders. If you don’t have a Meijer near you, I’m sure other grocery stores offer similar savings apps and programs – so trust me when I say it’s worth a look since I saved almost $1,000 in 2017 on my food purchases alone! So those are the top three ways that I get paid to shop. I really hope you take advantage of some of these programs – I’ve saved/earned back $50 this month alone from eBates so you can take my word for it! Happy shopping!